Anyone who wants to make a swimming pool out of an abandoned metro station neglected for 75 years, has definitely got my attention. The ghosts of the Parisian underground could soon be resurrected if city voters play their cards right in the upcoming mayoral elections. Promising candidate, Nathalie Koziuscot-Morizet, who would become the first female to ever hold the post in the capital, has released the first sketches of her plans to reclaim the city of light’s abandoned stations. Up on the candidate’s drawing board we have several proposals to revive the stations from their solitude, including my personal favourite, the swimming pool (just imagine doing laps down an old subway track), a theatre (think of the acoustics), a restaurant, an art gallery and a nightclub. Participating architects Manal Rachdi and Nicolas Laisné are only getting started however, and these are just a few examples from their vault of ideas should Nathalie win the elections in March. 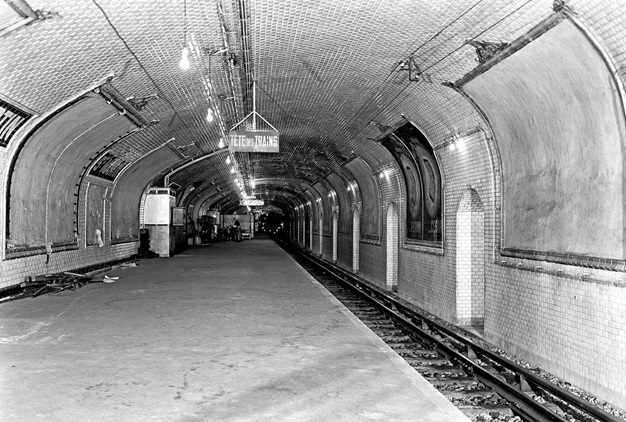 While some of the ghost stations were closed down due to a lack of passenger use, others never even saw a single traveler on their platforms after planning was scrapped and access from the streets above was never even built. 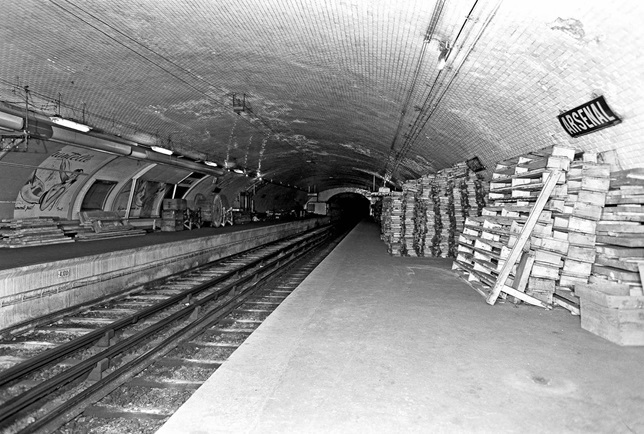 Built in 1906 in the 4th arrondissement of Paris and closed in 1936, Arsenal is today used as a sort of dumping ground by RATP (the transport operator of Paris) for testing equipment. Over the years, some of the stations have been employed by the film industry on occasion, serving as a backdrop for movies or commercials. 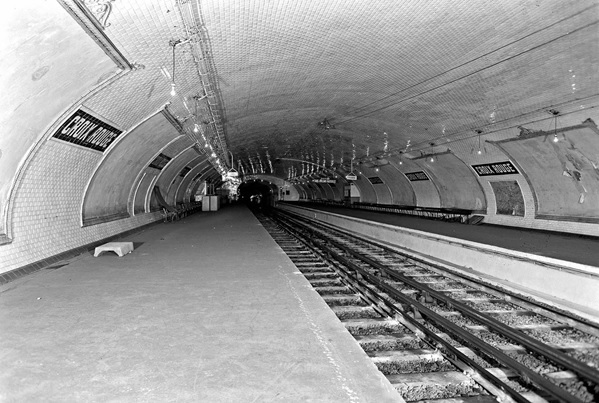 Metro St. Martin (pictured above), which was closed temporarily during the war and then shut down permanently after the liberation of Paris due to its close distance from another station, was employed in 2012 by Ridley Scott for his film Prometheus. The Croix Rouge was briefly re-used for an exhibition in 2007 while the Porte de Lilas metro below, is frequented more and more for the filming of commercials. 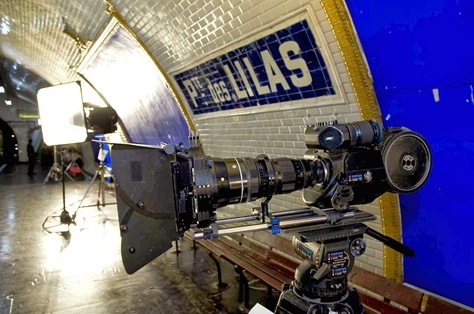 There are eight “phantom” metro stops in Paris that would be suitable for revival, including Champ de Mars, Arsenal, Porte Molitor, Haxo, Croix Rouge, Porte des Lilas, Saint Martin et Martin Nadaudso. The ambitious mayoral candidate Nathalie Koziuscot-Morizet has also put forward plans for reviving the Little Belt (Petite Ceinture), the inner city railway, abandoned since 1934. See her proposal here. If you have any of your own little creative ideas for repurposing the sleeping stations of Paris, share them in the comments or better yet, tweet your suggestion to Nathalie Koziuscot-Morizet. Photos via NK Paris and RATP/ 20 Minutes.